G2 version of a TX81Z factory preset. According to a shareware editor, the original used triangle on op1,2 & 4 but I cant get it to sound even close with the G2 PM oscillator triangle. Also the envelope is a little different, I've routed the env out through it's own vca to get closer to the TX81z shape curve. I hope you don't mind me asking a bit of a beginner question here? I like the sound of this patch and am trying to get my head around how it works. I am starting by trying to understand the right side with the OscPM2, EnvADSR1 and LevMult1 modules. In the EnvADSR1 module you feedback the output of the envelope into the input, I am trying to get my head around this and failing, why are you doing this? That's a classical trick. Basically it's like multiplying the signal with itself which gets you a different curve. Works in may systems but anoyingingly not in the NM A-D envelope which for reasons that are quite beyond me S&H's the mod input at triggering time. it's like multiplying the signal with itself which gets you a different curve. Exactly, I was A/Bing with a sample from a real TX81Z and the decay time was right but it needed more energy in the 1st part of the decay. At the start of the decay you have gain = 1 X 1 = 1 so the intitial value is the same, as the decay drops to 0.5 you get 0.5 X 0.5 = 0.25 so your at half the level of the input curve. The static shaper module is also good for getting different shaped curves. In this patch, the OscPM2 signal modulates the operators in the left chain and itself ( called feedback FM ) which gives it a sharper tone. This bass is used a lot in dance music. I have been looking a bit more and noticed the EnvD1 does the same thing, I am going to make a simple patch so I can hear the difference in the envelope. Also Ian, just so I get this right in my head, the feedback to OscPM2 is modulating the phase not the frequency so why is it called feedback FM? I have done my test and now see how it works, the decay sort of accelerates. I also had a go putting the ShpStatic module between the env output and input, which changes it quite drastically. I also tried taking the env out and multiplying it by a lfo before feeding it back and got some very interesting results that totally confuse me, changeing the lfo frequency changes the frequency of the output! the feedback to OscPM2 is modulating the phase not the frequency so why is it called feedback FM? John Chowning and Yamaha call it FM but technically it is phase modulation. A bit gray I suppose because a change in phase is an instantaneous change in frequency (or so I read). changeing the lfo frequency changes the frequency of the output! Yes, sort of, because the LFO itself is set to a, for an LFO, pretty high frequency of 392 Hz which is an audible tone (the G just below the 440 Hz A "reference tone"). So in fact you are using the LFO as an audio oscillator. What happens next is that you multiply that audio signal with the signal coming from the "real" oscillator, which means you multiply two audible tones with each other. This multiplication of two audio frequencies is usually called ring modulation, but when one of the signals is not at audio rate its usually called amplitude modulation. And you just discovered these two are the same in fact. At the same time its being pulsed by the envelope, which is multiplication as well but not at audio rates, and so percieved as amplitude modulation. You can read a bit more about ring modulation in the editor's help file, its in "module reference/level group/ring modulator" and also in "synthesis basics/other synthesis and modulation/Ring modulation" (and the section above it about AM synthesis). Concerning the Phase mod / FM stuff. Now I get the idea that this is a FM patch it makes a liitle more sense (in the way that I have no idea how FM with more that two operators work) basically op 1 and 2 are summed then FM modulate op 3 which then fm modulate op 4, is this correct? So basically the signal being fed into the envelope has become an "audio" signal, this is then multiplied by the osc giving me ring modulation which is why it sounds a bit bell like. I understand now (I think!). The thing that was confuseing me was that I thought I was just changeing the amplitude of the env. I will have a look at the ring modulation sections in the manual and also play with replaceing the LFO with an OSC and shortening the decay time to see what happens. basically op 1 and 2 are summed then FM modulate op 3 which then fm modulate op 4, is this correct? The TX81Z is a 4 Operator FM synth. Can't use the G2 DX operator though because the TX has ADSRish envelopes instead of the awfull DX style ones. 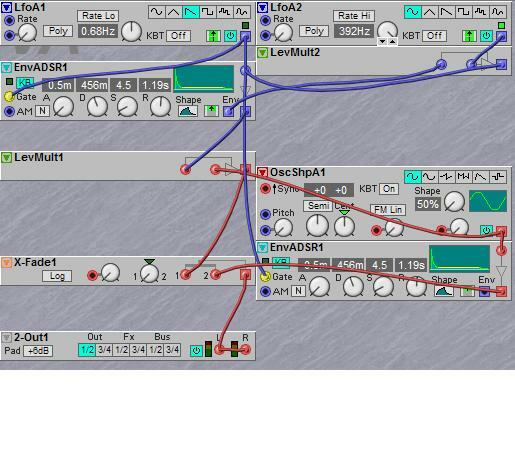 And it has the later, multi wave operator which in theory you can recreate with a PM osc + diode module + static shaper.